Oil on canvas, 8 3/4" x 11 3/4"
Blacks works are rare and highly sought after. He moved to Taos in 1925, where many think his best works were produced. He mixed both Impressionist and Modernist techniques. Parsons does not offer LaVerne Nelson Black prints, because no print can compare to the real paintings. He was born in 1887 in Viola, Wisconsin, in the Kickapoo River Valley, an geographical area with major Indian influence. Beginning as a youth, Laverne played with the children of the local Indian reservation. From his boyhood on, Laverne drew and painted, mixing his own paints from vegetable extracts, earth, clay and red keel, a soft stone used ceremonially by the Kickapoo Indians. In 1906, when Laverne was 19, his parents sold their restaurant and hotel businesses and relocated to Chicago. From 1906 to 1908, Laverne studied sculpture, painting and illustration at the Chicago Academy of Art. His outstanding work was recognized with a scholarship for his second year. He created illustrations for the Minneapolis and Chicago newspapers. 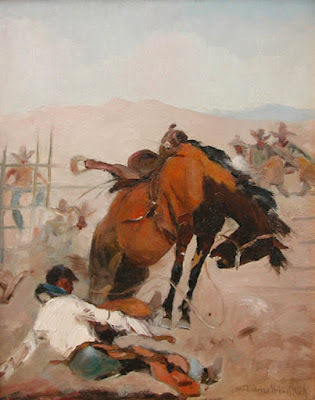 He traveled to the American West during his summers to paint and sketch American Indians. His bronze sculptures were sold by Tiffany's. They were the first so honored by Tiffany's since the times of Fredrick Remington. In 1925, as heath worsened, Black with his wife and two children traveled to Taos, New Mexico, in search of a drier and healthier climate. 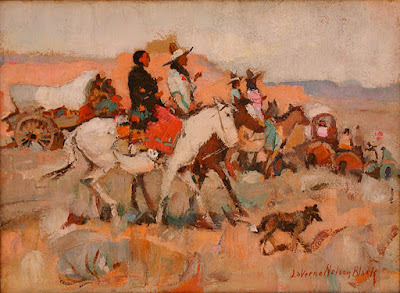 Influenced by his Taos Society of Artists friends, Oscar E. Berninghaus and W. A. "Buck" Dunton, Black's artistic style changed. He began to use vibrant, living colors in his masterful Western landscapes. Laverne Black's media include Bronze, Fresco, Gouache, Mixed-Media, Oil Paints and Watercolors. In 1937, because of the Depression and his health needs for a warmer climate, Black relocated to Phoenix, Arizona, where he found employment with the Public Works Administration. He and Oscar Berninghaus created four murals for the United States Post Office in Phoenix. His murals showed the historical progress of Phoenix. He also produced commissions for the Santa Fe Railway Company. The Company was proud to display his works at their largest offices. But his health continued to decline, perhaps from lead poisoning from his work. He died in Chicago, Illinois. in 1938. "Taos Indian Night Watch" Oil on Canvas Board, 16" x 20"
"Apache Festival a.k.a. Gathering for the Fiesta at Taos"